Fit Rovers participant Mark Metcalfe has heaped praise on Club Doncaster Foundation’s showcase fitness programme, regarding it as a “brilliant programme”. 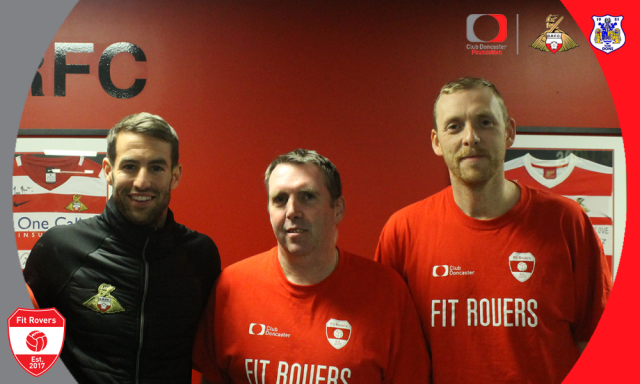 Metcalfe, who recently finished the eight-week programme on course 10 with fantastic results, has tried and tested a few fitness programmes before, but has stuck with Fit Rovers because of the variety of sessions, the educational lessons and the overall friendliness of the staff. When asked why he chose to do Fit Rovers, Mark was quick to point out the difference between it and other programmes. “I think one of the main things is the support that you get at Fit Rovers,” he said. “A lot of these other fitness programmes will be a scheduled time to do some sort of exercise, which is great, but there is no real backup to that. Mark lost an incredible 5.7kg on the programme, whilst also increasing his physical activity and reducing his alcohol consumption, and has put this down to the delivery of the programme. He said: “With the exercise sessions you’ve got so much variety. “You’ve got the option of circuits, football, rugby and boxing. When I first came along I thought Fit Rovers would be predominantly football, but I’m glad it isn’t,” he said. Fit Rovers has been a breath of fresh air for Mark, who wanted to thank the staff for all their hard work. “The staff are a huge credit to the programme. They really do take a genuine interest in me and the other guys,” he added.